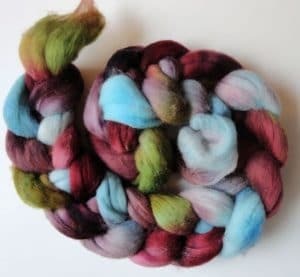 Before we get into a few other ways to spin hand-dyed braids, let’s pause and look at three basic types of ‘dye jobs’, in no particular order. One favorite is the randomly-spotted braid. 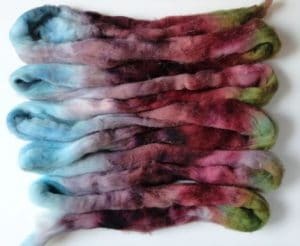 These are as fun to dye as they are to browse through! 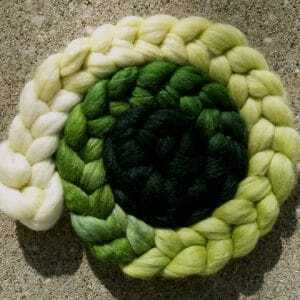 The colors, wherever they come from on the color wheel, have been applied in generally random order on the roving. They may be big blotches or little dots, and there may or may not be undyed fiber showing through. 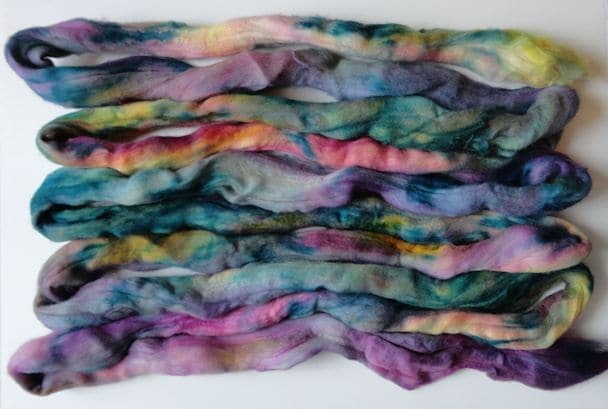 The real art in dyeing these is in the color combinations – they can be subtle, bold, or artfully layered, and the best ones are absolutely inspirational. 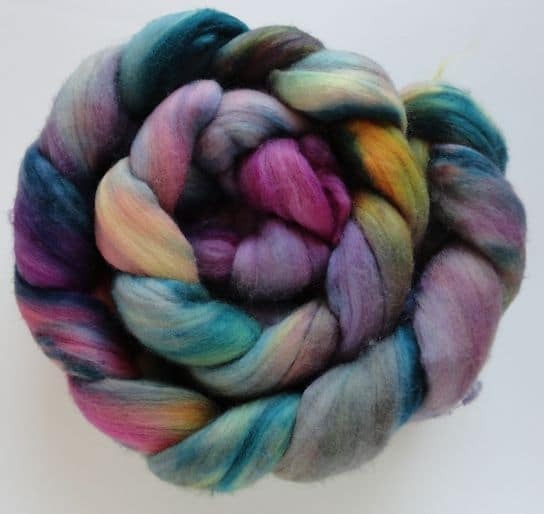 You can have lots of fun spinning this kind of braid any way you want, but unless you deconstruct it (more about that in a future post), the spun yarn will have random color changes, staying true to its origin. Next comes the repeating color pattern. The dyes may have been applied in narrow or wide bands, but the feature they all have in common is that the colors repeat at intervals. You may have to lay them out to see for sure, and to figure out whether those repeats are sequential or reversed. This should result in (ironically enough) a tweedy reversed repeat! But – all other things being equal, which they seldom are – there would be few or no solid areas, with the same color on both plies. And the same spinning treatment for the example reversed repeat? Well. That sure wouldn’t be worth the trouble, would it?! 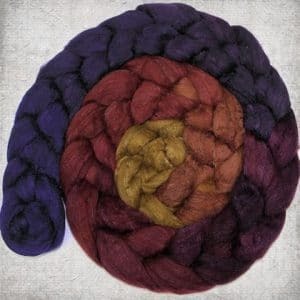 In this case, with equal sections of each color, the yarn would turn out to be mostly one solid color after another, with minimal barber-pole areas between them. 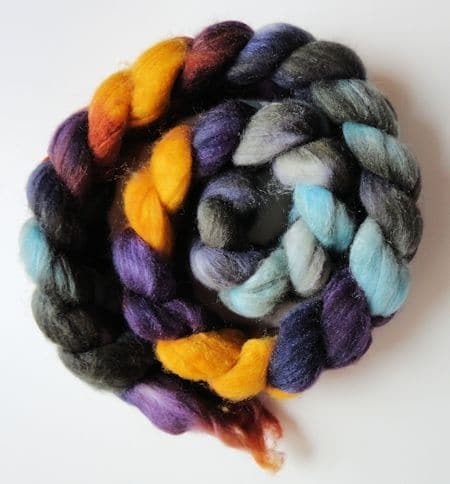 So if you were looking for plenty of marl (barber-pole) color interaction, you might need to shift the starting point for spinning one half, or choose another spinning approach. Then there are the gorgeous gradients. Whether a true gradient, gradually morphing through several changes from one color to another, or an ombre shading from light to dark of a single hue, these braids are probably the most difficult to dye. But, oh, they do enchant! 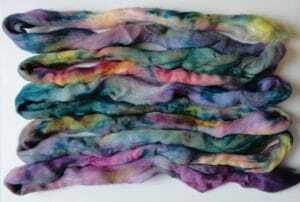 Some of my favorite eye candy comes from Kimber Baldwin at Fiber Optic Yarns. These just beg to be turned into yarn showcasing the gradient shifts. 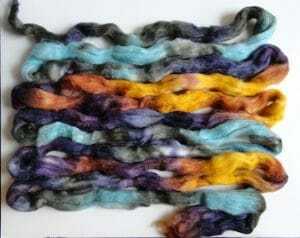 Most spinners either spin the whole thing starting at one end and then chain ply (also called Navajo plying) so color changes can be carefully managed, or split into halves lengthwise and spun separately, then plied. Expect such a two-ply to have a bit of marling as the colors change, but with gradual color changes, these bits may soften those changes even more! In the next post, we’ll look at some ways to take apart and recombine colors for various yarn effects. You have some beautiful yarn. I am attempting to weave again. I am having fun “trying”. How long have you been spinning? Do you also weave? Thanks, Terry! While I’m a devoted knitter, I have done a few small woven projects, and am looking forward to a class on rigid heddle weaving in the near future!